A few weeks ago I bought a couple of cans of Grands Biscuits. I rarely by these pre-made types of biscuits but I had a recipe in mind that I wanted to make because it's quick and kids love them. This is what I usually do with these biscuits. I use the flattened biscuit dough as a base and top it with a tuna or chicken mix and melt cheese on top of each one. We do love these little hand held pies. For some reason on this day, I decided to do something different. Like most "ideas" I saw something in my kitchen and it triggered a plan. The cupcake/muffin pan was staring me down and when I opened the fridge the biscuits fell into my hands. Together they would make a tasty meal. The mixture came together nicely, the biscuits worked as cups and my family requested these again. Those three things, in my mind, equal a success in the kitchen. ENJOY! In a large bowl, combine all of the filling ingredients. Mix well. 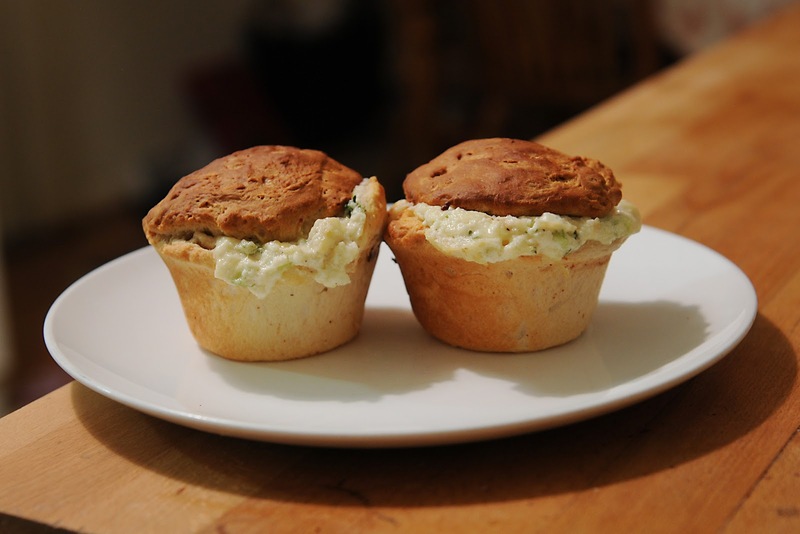 Spray your muffin/cupcake pan and using your fingers, tear your biscuit into a 70/30 break. If you do it in half, there is not enough dough on the bottom to cover the inside of the muffin space. You don't need as much to cover the top…so a 70/30 split is the best. 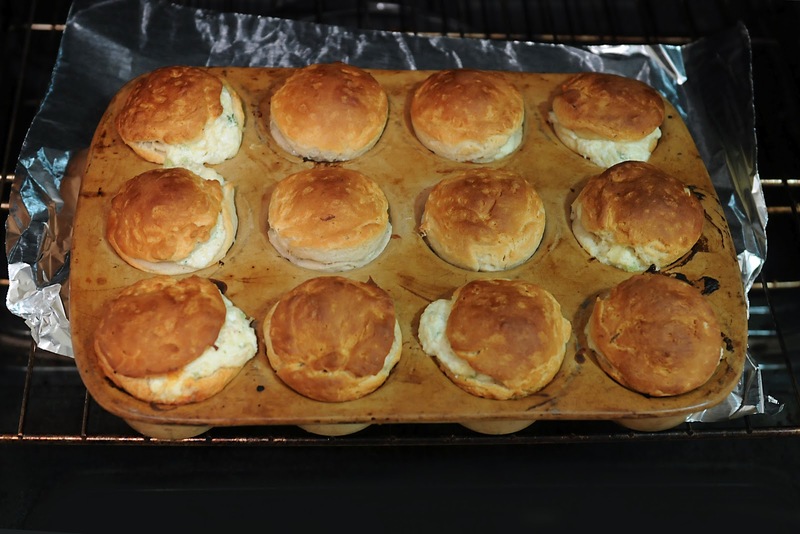 Push the larger portion of the biscuit into the bottom and up the sides. Put a spoonful of chicken bacon filling in each biscuit cup. 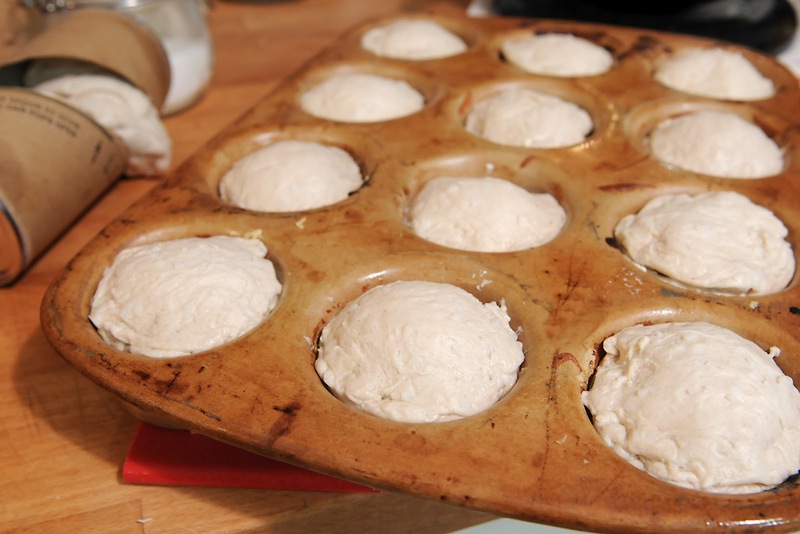 Flatten the small biscuit piece into a small disc and cover the tops of each cup…see picture below. You do not need to seal the two together. NOTE: I would not use a cupcake liner because the biscuits do not remove very easily from the wrapper. Love this idea, and yes (whispering so no one else hears) I also buy canned biscuits sometimes. We have to do what we have to do to feed our families! Can't wait to try this! Just wanted you to know, I made these the other night (using Bisquick biscuit mix) and my hubby and I loved them! These would also be perfect in mini tins (if you have the patience) as an appetizer! Joan…I am so glad to hear that!!!! Thank you for the feed back.